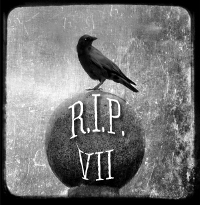 Okay, more recently I’ve signed up for RIP VII hosted by Carl at Stainless Steel Droppings. This isn’t actually a challenge. It’s all about the enjoyment and reading other people’s review and just frankly having a good time being involved. The idea is for the autumn, and to get you into the spirit, to read books that fall into the categories of mystery, chiller, suspense, dark fantasy, etc, or to watch films of the same nature. You can find the details here. I’ve got a few books lined up and can’t wait to join in. Go check out Carl’s site and join in. 1.100 books in a year challenge hosted again by Book Chick City (click on the icon to go to Book Chick City). The Debut Author challenge hosted by the Story Siren. Last Years Challenges are now completed, yay. This is my wind up post for2011. This year I’m probably going to do some similar challenges. I hope Book Chick City is hosting the 100 books in a year again. I love that site! Possibly might also go in to the Debut reading challenges over at the Story Siren and may also still check out the British Book challenge – thanks to Bookette for hosting that last year. I really enjoyed these three challenges. What I particularly liked about taking part is it actually makes you focus a little more on your book choices which was good. What I also really liked last year was taking part in a readalong. This is so good. It gives you the opportunity to discuss your thoughts and feelings really openly and it’s so nice because you’re all reading the book at the same time so you’re not in a waiting game (unlike when you pass on a favouritie book to one of your friends and can’t wait for them to read it so you can discuss). Plus, I got to check out some more really great book blogs and pick up some really cool books as a result through their recommendations. Don’t think I would have read Neil Gaiman or Jim Butcher without Carl from Stainless Steel Droppings – and they’re now definite favourites and I owe the Little Red Reviewer for Mark Lawrence and Jasper Kent. Also must mention Wondrous Reads – for half a ton of YA, Legend and being totally obsessed, like me with Game of Thrones (Sean Bean and Jason Momoa *sighs*). Plus, for the month of January I’m trying to read some more sci-fi. I’ve already read Jules Verne Journey to the Centre of the Earth, not yet posted yet, which is for the Vintage Sci Fi event over at the Little Red Reviewer and just about to start Foundation as part of Stainless Steel Droppings sci fi read along (already behind of course). Personally, I’m revising my eating habits (in other words going on a diet – except I don’t like to say that ‘I’m dieting’ prefer – ‘healthy eating’ – it all of course boils down to the same thing – less calories!!!) and also need to get back into walking and doing a bit of keep fit. For the month of January I’m not drinking any alcohol just to be nice to my body after the Christmas excess. I must admit I do miss a glass of wine when I’m reading! Oh well, only another 24 days to go. And, that’s it for now.